One of nine distract isomer of inositol. It is synthesized from glucose-6-phosphate and metabolized to phosphatidylinositol. It balances certain chemicals in the body to help with the condition like panic disorder, depression,OCD & PCOS. It decreases level of excessive androgen thus helps in PCOS. It also improves the ovarian response to gonadotropins thus ensuring regular menstural cycle & succesful ovulation. Myo-inositol administration is a simple & easy treatment that ameliorates the metabolic profile of PCOS patients reducing hirsuitism & acne. It is essential to form healthy cells especially RBC's. Make up for low levels of folate thus prevents anemia. It is an active form of folic acid which is integral component of pre-natal care,homocysteine mangement and cardiovascular health. 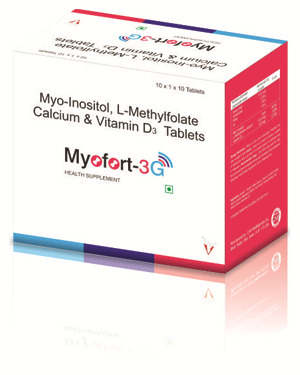 Helps to maintain the function of nerves & aids in calcium absorption. Vitamin D supplementation has been found useful in regulating menstural cycle in PCOS women.